Marble top coffee tables bring a touch of elegance to any living or family room, but they don’t have to be overly formal or old-fashioned! 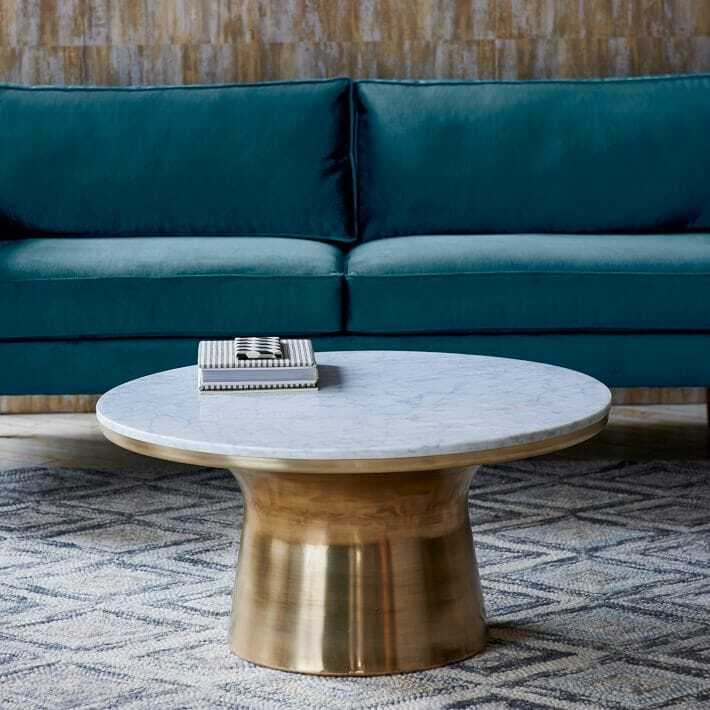 Check out these gorgeous, modern marble topped coffee tables to bring a casual elegance to your space. 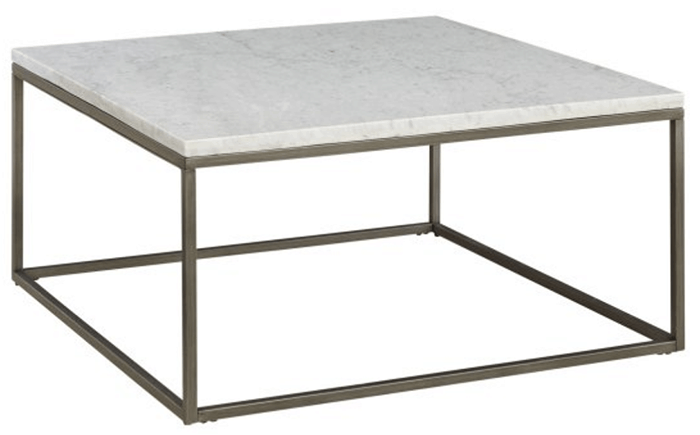 If there’s one design item I am always confident I will love in my spaces, it’s marble. The timeless, cool toned yet organic, casual elegance of marble is completely my style. Maybe it has something to do with my early experiences. Whatever the case, it’s my go-to for kitchens and baths (like last summer’s renovation), and I shared recently how we keep it clean (which – spoiler alert – is really easy! )… So I recently had the thought: why shouldn’t I bring it into my living room, too?!?! 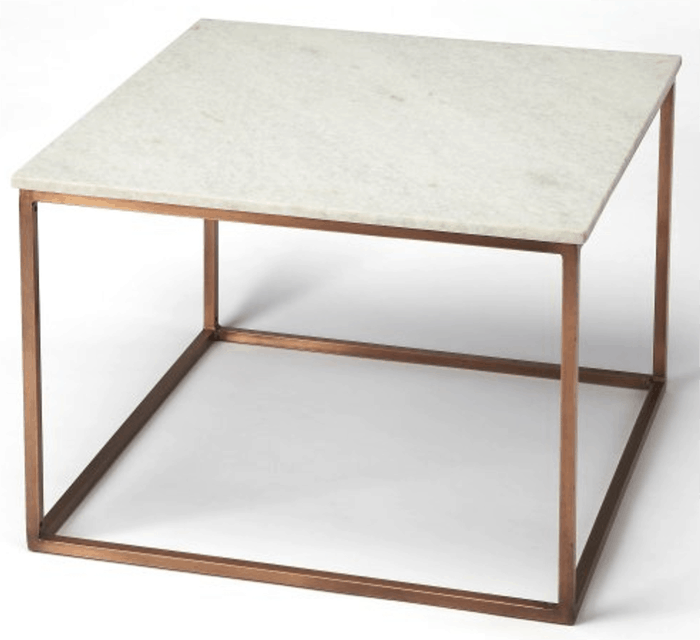 This started my quest for the perfect marble-top coffee table. And you know what I discovered? I like them all! But seriously, I will have to narrow it down at some point. 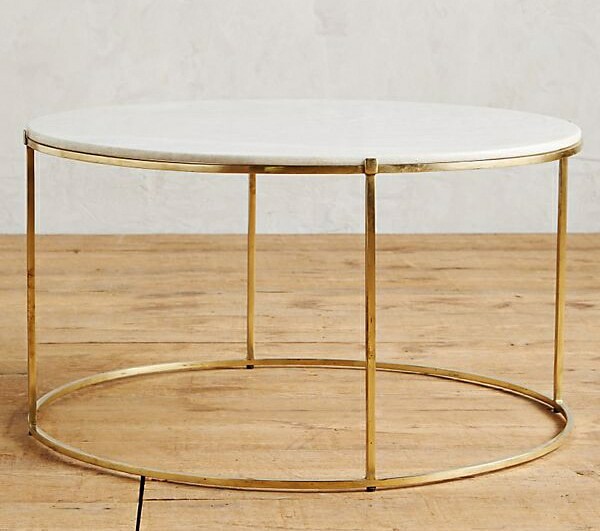 😉 In the meantime, I thought I’d share some gorgeous marble topped coffee tables I found for you all, and there are so many options: square, rectangular, and round; pedestal or legs; brass, wood, black, or copper… the options are endless. And the prices range, too! Which is your favorite? For some reason, these seem the most classic to me. My parents actually have an amazing (and heavy!) 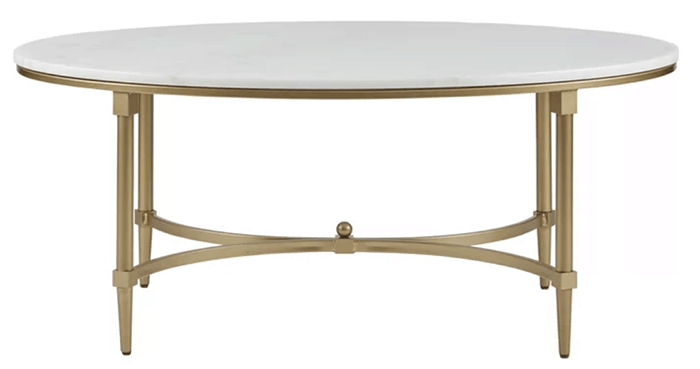 hexagonal vintage brass base with a glass top currently… I may just have to snag it from them and add some marble. 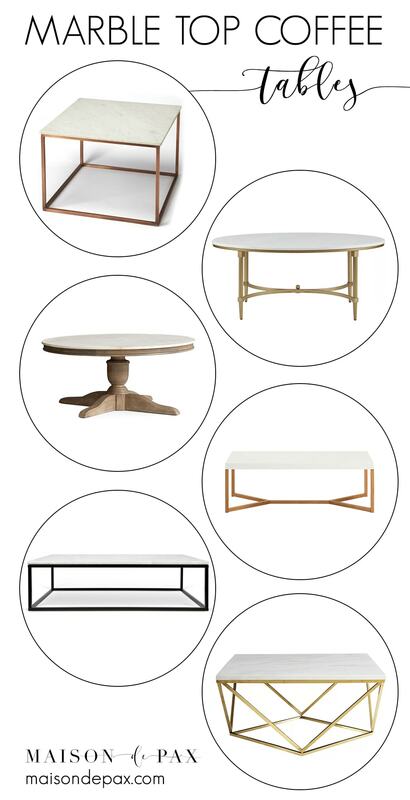 I love, though, that even with the classic brass base, there are so many shape options! 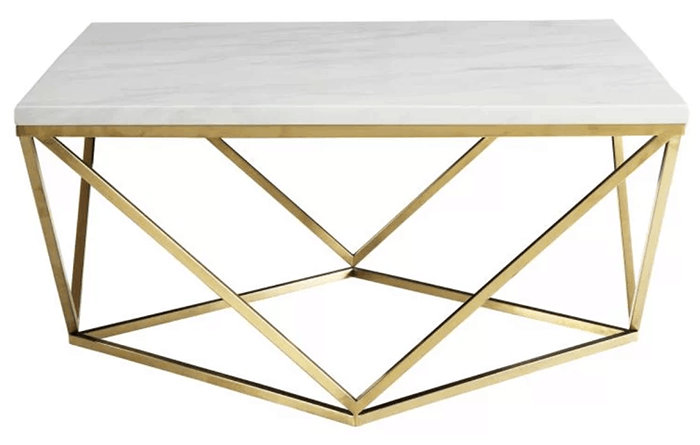 The geometric base and pedestal base make an especially modern marble coffee table, I think. 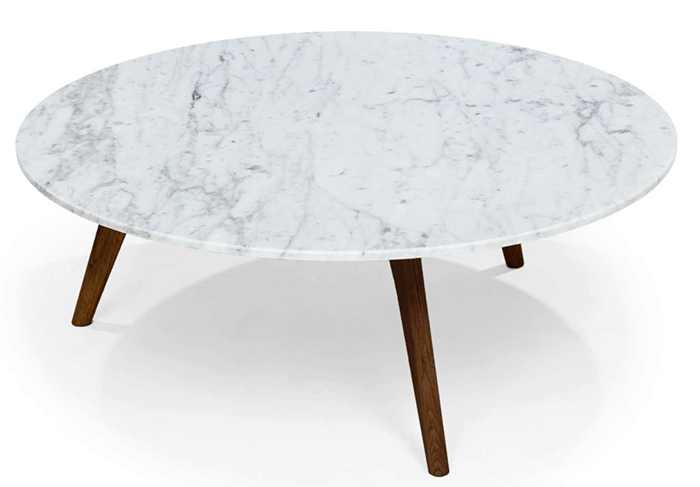 A wood base on a marble coffee table can go so many directions stylistically: traditional, modern, or even mid-century. One of these is fun because it’s not actually a marble top… but it has a similar look and a great price! Can you tell which one? 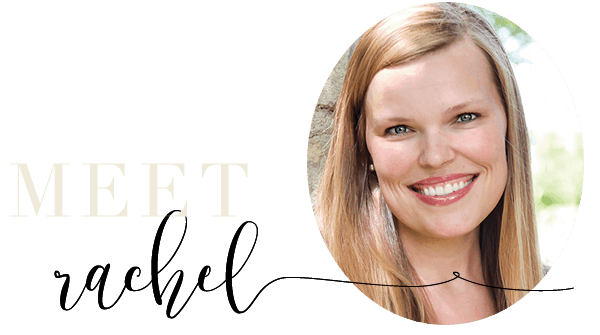 I realize the bright brass was a metal base, too, but there are so many other metal options! I’m loving this copper one (because, as you know, I have a thing with copper 😉 ), and the black ones would be so sleek. The muted brass is a great, more understated option, too. Tell me, which is your favorite?! Be sure to pin this for later! Bordeaux Coffee Table is my fav! I love the marble top with brass pedestal although I’d probably purchase one of the lighter airy designs! When my children were little I had a fake marble top coffee table (I think the base and legs were probably fake wood too!) that served well for many years. They could cut, paste, color, do whatever on it without any damage! Today I wish I had it still – I would paint the legs white to update it and put it on the porch!!!! Thank you for your continued inspiration!!!! Good thoughts, Joanna! I have marble in my kitchen so I do keep a close eye on maintenance. 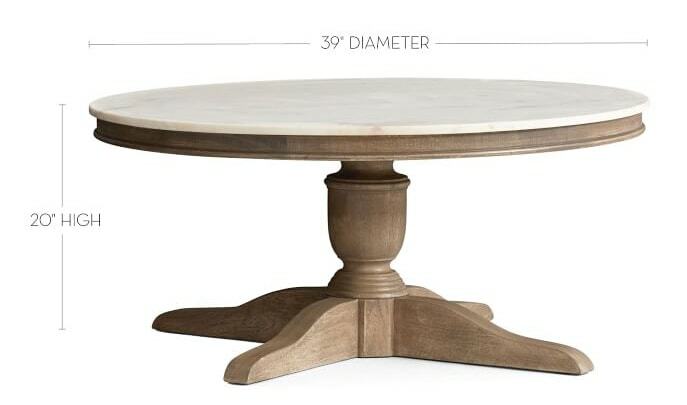 I love the Leavenworth table … and my thought about it is just as you mentioned ~ snag that from your parents, and add a marble top. Then you have the sentiment of it being a family piece, *and* it satisfies your love of marble! It seems to me to be a style that will meld easily into most any decor. I think the sharps edges on other shapes can tend toward a more modern look, but I like them all for various reasons. Hope your “sickies” are much better … and life returns to “normal” very soon! Thank you Kathleen for your kid note! They are slowly improving. I agree with you. I like the idea of using a piece from my family and adding a marble top. Good thoughts. I like the table with the wooden base . (round). I love the mix of marble and wood, too! So hard to choose, right!? 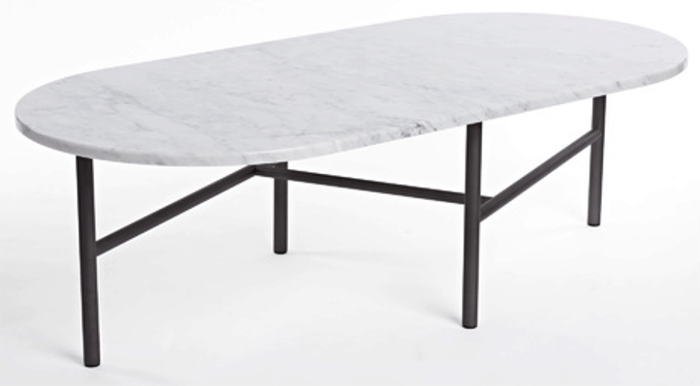 I like the Marva Marble Coffee table . Thanks, Shelly! I like it too!